California Pizza Kitchen is a popular restaurant chain that specializes in authentic California-style cuisine in more than 250 locations across the globe. In honor of National Pizza Month in October, CPK wanted to build hype around the month long event and encourage customers to come in and try their favorite classics, reimagined. Capitalizing on the exploding popularity of personality quizzes, Socialtyze developed a quiz app that was launched right before the kickoff to National Pizza Month. The personality quiz asked a series of questions to reveal a user’s ‘Pizza Personality’, which predicts the way a person eats pizza and how much it says about them. Results included The Folder, The Knife and Forker, The Toppings Thief and The Deconstructor. Fun Fact: People are 3x more likely to be The Folder than any other Pizza Personality, but…it’s pizza. So everybody wins. The personality quiz app was a big hit with CPK fans as the app received over 11,000 visits from users. 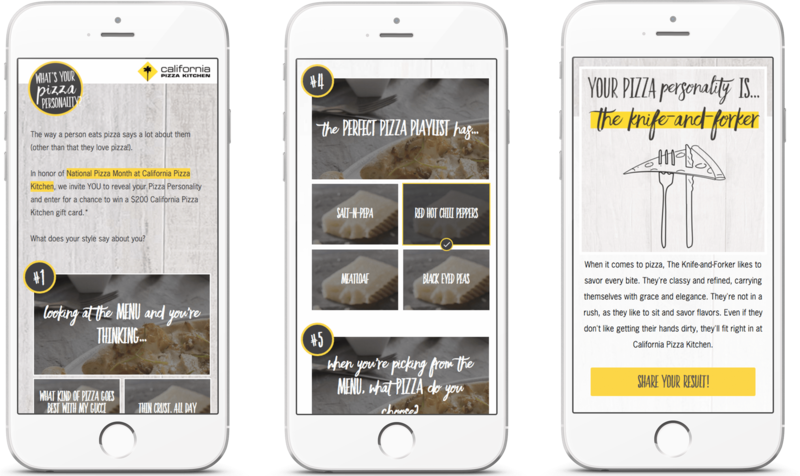 More than 10,040 users were entered into the contest for chances to win a $200 California Pizza Kitchen gift card, and CPK collected as many emails for their CRM.